Discussion in 'Guitars in General' started by Desolation Angel, Apr 29, 2016. Came across one of these, today... and rather liked it. 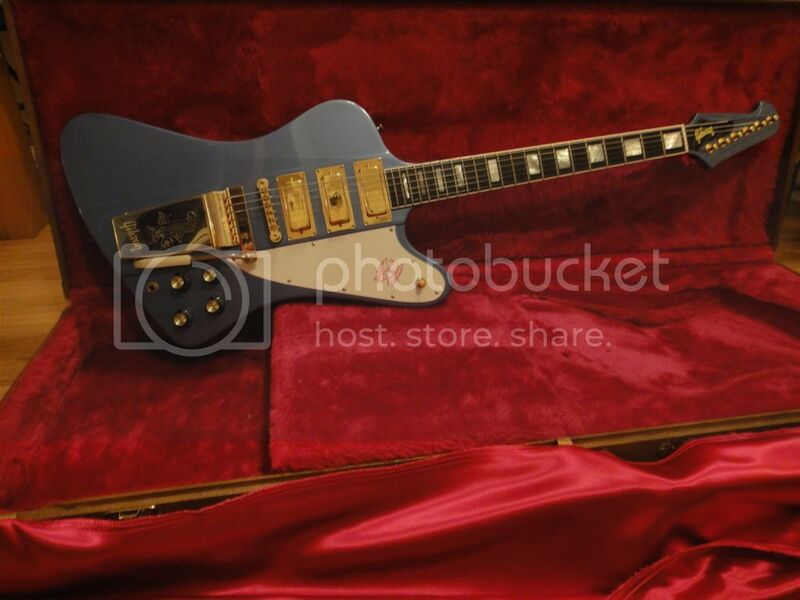 Can't seem to find any info on it outside of retail sites (it doesn't exist on the Gibson website). I don't know but what an awesome looking guitar. No wonder you had that reaction. bsacamano and theon like this. 2016 Limited Release found this one on the web. Kind of smooth! Hendrix used a Lyre on his White SG Custom. That's Hendrix though. Not sure if the rest of us could conquer it. Ilduce and Dashface like this. Yeah, I can find a few retailers with them on the web... but no reviews, no official stuff... just selling pages. Basically it's my Firebird with a Lyre vibrato. That's no slam... it's an amazing guitar. Not sure if the Lyre really adds almost a thousand dollars to what the sunburst Firebird V is selling for currently, though. Custom50, Starshine and sixstringfuel like this. *******. I mean, if that's not a killer looking guitar, I don't know what is. The first thing I thought of $900. For the vib. I love my 2016 firebird t one of the best sounding and feeling guitars I ever played and the fit and finish are flawless. The neck is pure pleasure. I was tempted to buy a lyre on reverb for mine but decided it perfect the way it is. It is. I mean, it really is. Just going through the specs (as good as I can find them) and don't see much difference... main one is the Lyre and the tuners (the lyre version doesn't have those planetary types). Weirdly, on the specs I'm looking at, it shows the lyre version as having a 'set in' neck as opposed to through body. Other than those three differences, not much else. Oh, and the paint job, you can't get Pelham Blue on the V. Oh, and it comes with a hard case. (I can't express how much it irks me that a $1000 guitar doesn't warrant a hard case with Gibson, these days, and the fact that Gibson state that the soft case offers the 'utmost protection'). IMO a Firebird would be a better guitar with stop tailpiece or a B5. I've never played a Lyre that worked particularly well. They do look cool tho! Starshine, Matt L, theon and 1 other person like this. You know, I didn't even notice those awful tuners on there. That has no business on a Firebird like that. The Steinbergers are great, the banjos are fine, but Grovers really don't belong on that model. Awful. No upgrade of any kind. p19978, Otter359, Starshine and 1 other person like this. Save $900 and get the stoptail version with the proper headstock and excellent Steinberger tuners. Just got back from playing mine at a gig for the first time. Tons of compliments on it. Pelham Blue? Great. Lyre? Wonderful! Upside-down tuners? Are you kidding me? The whole killer aesthetics of Dietrichs' lines are out the window. The headstock looks like a Gumby. Get those Grovers out of my sight. Fail. Starshine and sixstringfuel like this. Yea, mine is a 2014. Not real happy about this huge price discrepancy. Instantly, mine took a $400 resale value hit. Thanks Gibson! Actually, there is a Firebird on there... 'copper vintage'... which has regular mini grovers going along the top edge of the headstock. Agreed on the stoptail, not a fan of the b5 but I think the FBI's with wraparounds look great. I have a pelham blue firebird VII and the lyre vibrato is awful with regards to feel and tuning stability. I think it's a terrible vibrato... it's for looks only IMO. theon and Matt L like this. I think I kinda feel the same. I wasn't impressed after a few minutes play (although I did accept that the guitar was also in need of a set up). I always have a little chuckle about the Derek Trucks signature SG... with the fake lyre plate. So that is the streamlined headstock on there, also. I seem to be missing a lot about this guitar. I have that cut-down headstock on my non-reverse Firebird, there's nothing wrong with it. But it does look a little out of place on this Firebird, nowhere near as out of place as those stupid tuners, though. But clearly Gibson is just putting on a cheaper headstock. I have no idea what they are doing with Firebirds. Cool that they dropped the price, although I paid like $600 more for mine, I shouldn't complain because I never felt that I paid to much when I got it. But this thing, with the tuners that go against the aesthetics quite a bit and the cheaper headstock, the huge price tag all to accommodate a Lyre vibrato? Still, the 2016T model is a great guitar for the price. I still don't know why anybody would but this instead of that and put on a Lyre themselves, save a lot of money. I actually went in to look at the new 'faded' SG with the mini humbuckers (which is even cheaper) and then ended up playing that Firebird. I went off new Gibsons a couple of years ago (the 'government' guitars started it and then the 2015 thing sealed the deal) but I've really been jonesing for an SG of late–I've never had one–just as something different from everything else I have. The minis on the faded special 70s are the same as on the Firebirds (the 495s). I'm still thinking that that SG is a very good deal (although I don't like the satin finish at all).